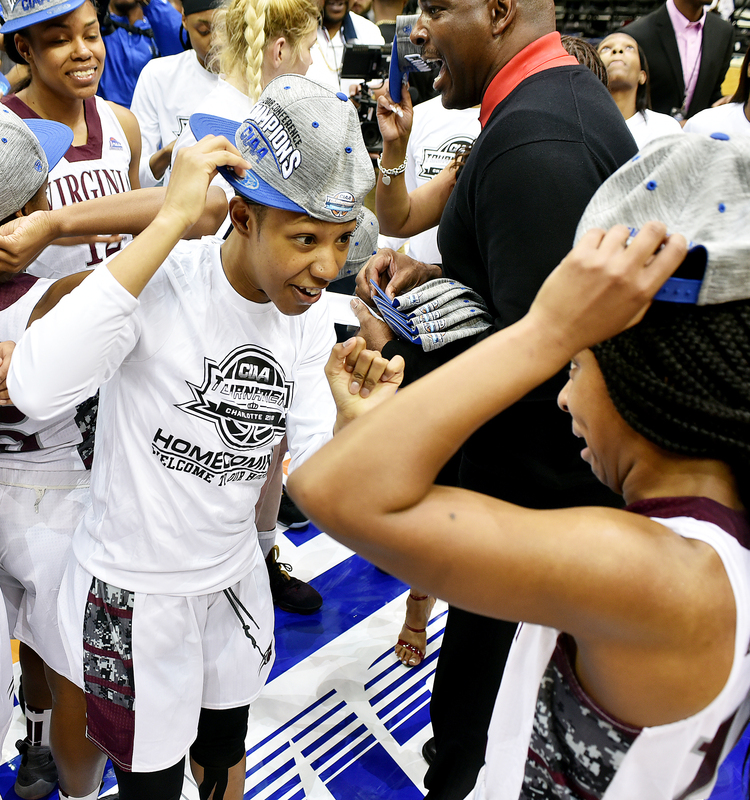 The Virginia Union women, ranked No. 4 in NCAA Division II, bring enough talent to the court to strike fear in any opponent. The Panthers (28-2) won their second Central Intercollegiate Athletic Association tournament championship in three years with a 73-57 beat down of chippy — chirpy? — Bowie State on Saturday afternoon at the Spectrum Center in Charlotte. For Panthers coach AnnMarie Gilbert, the talent load starts with lanky 6-foot senior forward Alexis Johnson, who came into the tournament as the recently crowned CIAA Player of the Year and Defensive Player of the Year. Johnson, a native of Hamilton, New Jersey, averaged 17 points, 9 rebounds and 3.4 blocks on the season. For the tournament, Johnson had games of 19 points/nine rebounds and 20 points/11 rebounds before scoring 21 points, pulling down 18 rebounds and blocking 5 shots in Saturday’s championship game. Needless to say, Johnson was named tournament Most Valuable Player after the game. But Johnson didn’t even lead her team in scoring Saturday. That distinction went to 6-foot senior forward Pecota, a sharpshooting 3-point specialist who scored 28 points and grabbed 10 rebounds against Bowie. She was 9-of-17 from the field, including 2-of-5 from behind the arc. Pecota, 27, is a San Francisco native who previously played at Northeastern University and enrolled at Fresno State and San Francisco State but never played there. She moved to Virginia in 2013 but had been out of organized basketball for five years when she was discovered in an off-site shootaround by a VUU assistant. Previously, Pecota had been rated the 25th-best wing in the nation by ESPN, according to the Richmond Free Press. The only white athlete to ever suit up for the Panthers women, Pecota moved to the East Coast after she lost a friend to gun violence. On the season, Pecota averaged 15 points and eight rebounds. Johnson, Pecota and teammate Shameka McNeill were named to the All-Tournament team announced after the championship game. McNeill, 5-foot-5, makes up one half of the freshman twin dynamos, along with her sister Shereka, 5-foot-6, who played the tournament in their hometown of Charlotte, where each was a 1,000-point scorer at Harding University High School. The Bowie State players refused to assess the Panthers players in the postgame interview immediately after Saturday’s game. But Darrell Mosley, coach of Lincoln (Pennsylvania) University, whose team fell 73-50 to VUU on Friday night, described the Panthers this way: Pecota is a proven 3-point threat, Johnson can score from anywhere, and then “she is blocking shots from all over the court,” he said. “The twins can knock down the 3, and they can penetrate,” Mosley added. Then there is the assist machine, Spivey, a 5-foot-8 junior guard from T.C. Williams High School in Alexandria, Virginia. Spivey leads her team with seven assists a game. “Some of the sets we run, we wouldn’t be able to do them without her,” Gilbert said. Spivey also has a sneaky sense of humor. As she was leaving the interview area on Saturday, carrying a case of CIAA commemorative Coca-Cola soft drinks, Spivey was asked why the Bowie State players had refused to analyze the Panthers players’ performances. “They were talking smack throughout the game,” Spivey said. What looked to be the largest crowd of the week turned out Saturday night for the men’s CIAA championship. 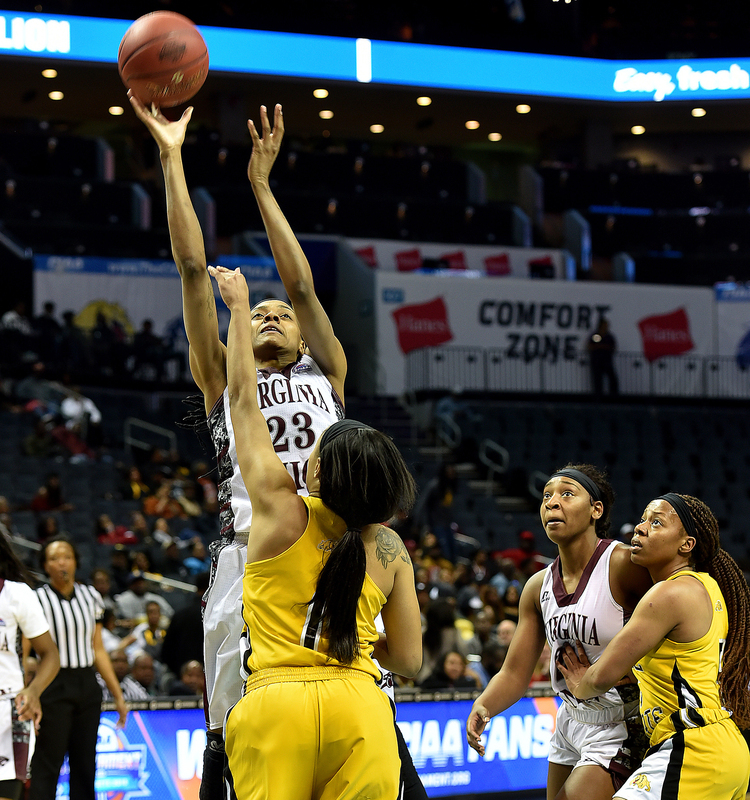 That game saw hometown favorite Johnson C. Smith (20-11) take on Virginia Union (18-14), which was trying to pull a Richmond double after the VUU women had won in the afternoon session. Virginia Union #35 Todd Hughes squeezes his way between Johnson C. Smith player for the basket. Let’s just say the Richmond faithful had more happy faces, as VUU won 82-52 in a game that was no contest from midway through the first half. For VUU, it was the first men’s title since the days of Hall of Fame coach Dave Robbins, who won in 2006 and retired in 2008. Robbins also won three national championships for the Panthers. Virginia Union coach Jay Butler also added a coveted feather in his cap, becoming one of the select few to win CIAA titles as a player and as a coach. 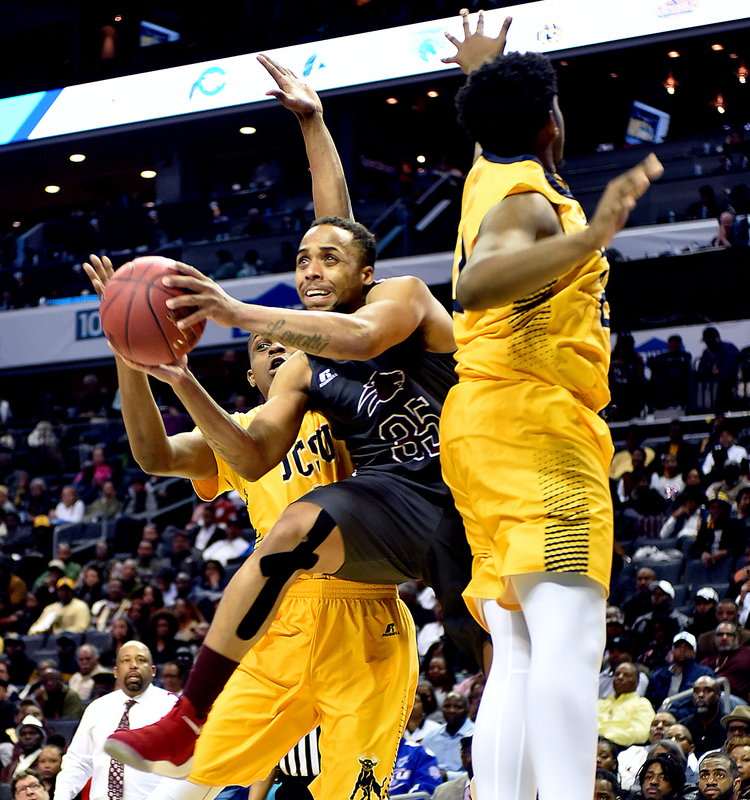 The last time one school swept both CIAA championships was in 2009, when the Johnson C. Smith Golden Bulls pulled it off.